The moment the big buck walked into view I knew he was one of the two 10-pointers I had been bow hunting. But with only a side view of his antlers, I couldn't tell which one. I ducked behind a bush after spotting a deer feeding with it's head down as I approached a one acre clearing. Seeing that it was a doe, I was debating whether to wait and see if one of the big bucks was around or just continue on and not waste time worrying about spooking her. After all it was 2:30 in the afternoon - a good week before I expected to see any serious rutting activity - and I still had a lot of territory to cover searching for buck sign. I was thinking this while watching the doe through binoculars when the buck walked into view. I decided to wait. After a few sniffs at the doe, the buck walked into the clearing toward me. He stopped about 40 yards away and began thrashing a small bush, pausing occasionally to look around. At that short distance and through the binoculars his antlers looked big bigger than ever, though I could see he was the smaller of two 10-pointers I saw during late summer scouting. 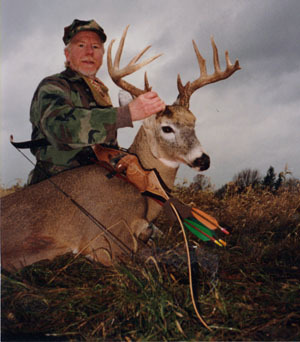 His spread of 18 inches was noticably narrower than the over 20 inch rack of the bigger buck. However, as he raised his head, I realized he had two additional points sticking straight forward from the brow tines. This made him a 12-pointer and suddenly it didn't matter to me that he was the "smaller" buck! I watched him for a couple minutes then eased back behind more brush so I would be better hidden if he came closer. Instead he walked back to where the three does were now feeding along the edge of the clearing. They ignored the buck, and he seemed content to just sniff around. I started sneaking parallel through the brush until I found a spot to set up to try calling him. A few short calls on my grunt tube got his attention. But, after staring in my direction, he moved slowly away with the does. I had to make something happen. I gave another grunt, then bent a branch over and began thrashing the bush trying to duplicate the sounds he had made earlier. This was something he had to investigate. But, instead of coming towards me, he cut across the end of the clearing. With the hair on his back standing on end, he moved towards the woods in a stiff legged walk that seemed to indicate aggression and suspicion. As the buck disappeared behind a small hill 70 yards away, I suddenly realized his plan; he was using the cover of the woods to circle downwind. Great! All I had to do was sneak into the woods and set up in bow range of where I expected him to come through. My immediate problem was that I had to cross a 15 foot opening within view of the feeding does. I waited until all three had their heads down, then crouched low and zipped across. As I ducked into the woods, I glanced back to see one doe looking right at me. I knew my chances just went way down. I set up in the woods anyway, hoping the hadn't picked up on the alarmed doe. After a thirty minute wait I knew I'd been given away. Instead of being disappointed, I was really encouraged. This was my first sighting of either big buck since the archery season opened three weeks earlier. I spent the rest of the day, a Saturday, and all of the next day in that area hunting and preparing sites for my portable tree stands. On Monday, after an uneventful morning in one of my trees, I was checking a brushy area about half a mile away. As I came up a slight rise I spotted a buck 60 yards away through the brush. I nocked an arrow, and I saw through my binoculars he was the 12-pointer, I was a bit surprised to find him so far from my Saturday sighting. He walked from bush to bush, intent on rubbing each one as he angled towards me. One of the key tricks to killing big bucks is deciding quickly on the right course of action when presented with the opportunity; I knew I had to do something soon. I'd hunted this area many times and knew of a natural funnel where deer pass close by the base of the short but steep hill. The crossing was several hundred yards away, but if I ran I might get there before the buck passed through. I put my arrow back in the quiver and took off up the hill. As I ran along the top I had to crouch low to stay out of sight, but I ran as fast as staying quiet would allow. My greatest fear was that I would jump other deer and alert the buck, but I had to hurry regardless. As I neared the crossing, I remembered shooting at a long-tined 8-pointer in this same spot two years earlier. I had misjudged the distance because of the steepness of the slope and my arrow went over his back. I would benefit from that experience this time! I nocked an arrow and checked over the side. I was surprised to neither see nor hear the buck. I was pretty certain he headed this way, and didn't think he had passed by yet. While standing there wondering if I'd spooked him, I suddenly heard antlers thrashing a bush about 50 yards back. That sound accelerated my heart rate even more than the running had! I crept along an outcropping above the crossing, realizing my palm was slick with sweat against the smooth wood of my recurve. After a quick wipe on my pant leg, I got into position behing a light screen of brush. Now I was sure the buck would come through the funnel below; I could only hope that he would pass within range. Suddenly he appeared, walking toward the crossing and holding his big rack above the very dense, 4 foot high, brush. He was quite a sight in the morning sun, and I took a few deep breaths to calm down. He would pass at 25 yards - the limit of my bow range- but there was a good sized opening ahead of him. As I looked down the steep slope at the opening and watched the buck's head and antlers approach it, I was suddenly filled with confidence that I could make a good shot. By now I had lost track of the buck, but as I neared the end of the hill I could again hear him. Then I saw him running more slowly now as he veered toward my position. I started getting another arrow ready as he turned once more and seemed to duck into an especially thick patch. Then all was quiet. Although I couldn't see the buck, I knew he would go no further. I sat down on the hilltop, feeling the elation while re-thinking the events. I'd killed several mature bucks with my bow, but always from a treestand. I had always wanted to shoot a big buck while bowhunting from the ground; this felt like a real accomplishment. Once my nerves settled, I walked quietly the 100 yards to where my buck lay. As I looked over him I felt remorse for this beautiful animal, but I also felt grateful that my shot had been quickly fatal. My arrow was through both lungs, so I was surprised he had traveled so far. He'd ran in a big "Z", covering a good 300 yards in an amazingly short time. The buck was 4 1/2 years old and had a dressed weight of 154 lbs. His antlers are a beautiful basic 10-point with the two extra sticker points adding nice character. The Pope & Young score of 135 gross and 125 net qualifies for entry in the New York State Record Book. My second in as many years. Although he's not one of my biggest bucks, I consider him to be one of my best. Largely because of the excitement and intensity of the hunt, and the great feeling of accomplishment. I finally did see the twenty inch 10-pointer, alive and well, during the late archery season in December. He was as impressive as ever. I guess I'll be back there again next year!